There has been a growth over the past few years of website's offering information about graves in churchyards and cemeteries worldwide. Sites which are well known include DeceasedOnline (subscription site), Interment.net and Findagrave. One that has recently come to my attention is Gravestone Photos which describes itself as an international grave monument directory. As with many similar sites it depends on the work of volunteers to photograph and detail the graves from each graveyard so the coverage is patchy but it now has 1500 cemeteries with over 440,000 names from 210,000 graves (there usually being more than one name to a grave). It is an international resource with graveyards as far afield as Canada, Malta and the Isle of Man but I have limited my review to the coverage of Sussex. There are 40 Sussex graveyards listed (and three more to be added this year); you can search all graveyards (worldwide) by surname or select and view the graves recorded within a specific churchyard. You can't do a surname search on a specific churchyard which is more of a problem when the graves run to several pages of information, although they are listed alphabetically by surname. Most churches are not complete; some such as St Marys in Felpham has only 1 grave recorded or St Peters in Henfield which has 28 graves. For each church there is a photograph of the church (if available) a description and map location. The description includes the number of graves included and how complete the coverage is. There is also a postcode for the graveyard which can be useful if you want to visit the church. One of the best things about this site are the photos of the graves, a small image is supplied (where available) of the grave on the website but you can request a better quality image free of charge. This project and others like it are vital because so many graves are becoming illegible due to wind and rain erosion and a myriad of other problems. They are also important because they make it possible to find where our ancestors buried, death certificates tell us about an ancestors death but they do not record where they were buried. Our ancestors do not always make things easy for us as they can be buried some distance from where they died or from where they lived. Grave stones often provide information and connections which are not readily available from other sources. 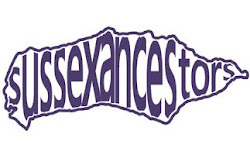 Although I have no Sussex connections, I enjoyed reading this. Newcomers to family history may not realise that people whose names appear on a grave are not necessarily buried there. For example, there is a headstone for my great-great-grandparents, William and Christiana HUDSON, in their home parish of Crambe, North Yorkshire, but William is buried at Middlesbrough. A funeral card passed down through the family gave me that information. In Australia we are very lucky, because death certificates for most States (though not all) specify the place of burial as well as the place of death.